Evaluating approaches to mapping burn probabilities for a quantitative wildland fire risk analysis framework. 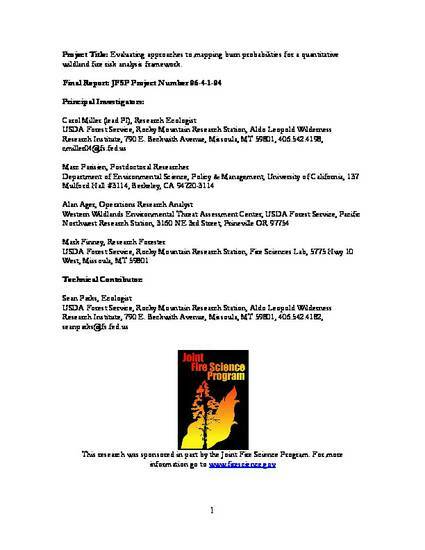 This final report summarizes a collaboration that brought together experts in burn probability (BP) modeling and wildland fire risk analysis to compare and evaluate BP models, and ultimately incorporate these into a risk analysis framework. The project built on and extended the work from JFSP project #01-1-1-05. This project evaluated and tested three different independent models that generate BP maps as output for their operational use in risk analysis. The project quantified the relative sensitivity of the three BP models to different inputs, enhanced our understanding of the factors that affect BP at the landscape scale, and yielded concrete improvements to BP models for operational use in quantitative risk analysis. The findings of this project have greatly enhanced our capability to reliably estimate BP and use this information in an applied setting. For example, our analyses have pinpointed which inputs can be further generalized (“shortcuts”) and which ones require more detail (i.e., “real world” variability). Land managers will benefit from this project by having a more robust measure of the expected losses and gains (both ecological and financial) resulting from wildland fire upon which to base decisions. This final report summarizes findings to date and lists the proposed and accomplished deliverables. A wealth of information pertaining to the project has been disseminated through published articles, poster and oral presentations, a PhD dissertation, and workshops with land managers. Furthermore, the knowledge learned throughout this project will be synthesized in a forthcoming General Technical Report.